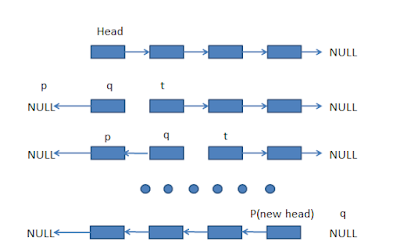 In order to reverse the linked list, you need to iterate through the list and at each step we need to reverse the link like after first iteration head will point to null and next element will point to head. At the end of traversal when you reach the tail of the linked list, the tail will point to the second last element and it will become a new head because you can now traverse through all elements from this node. Since we cannot use the java.util.LinkedList class to demonstrate this example, as it is a doubly linked list and also in most of the time on coding interviews, the Interviewer will not allow you to use existing Java classes or API. Anyway, in a doubly linked list, you can traverse in both directions like both forward and backward as each node contains the reference to both previous and next node. Btw, if you are not familiar with the linked list data structure, it's better to first go through a good data structure and algorithm course like Data Structures and Algorithms: Deep Dive Using Java to learn more about linked list data structure. Since using existing Java classes are now allowed on Programming Job interviews, you need to create your own to write code. For this example, I have created our own singly linked list class. Similar to java.util.LinkedList which also contains a nested static class Node, which represents a node in the linked list. This class contains an integer attribute to hold the data part and another Node reference to point to the next one in the list. If you want to create a Generic linked list, you should replace int with T , a generic type, as shown here. In order to demonstrate that our reverse method is working, we will not only have to create a linked list but also need to populate the linked list. In order to populate, you need to implement the add() method on the singly linked list. You have two choices, either add the element at the head or at the tail, adding element to head is easy as it doesn't require a traversal till the end but if you want to create a list which contains elements in the order they are added then we need to add nodes at the end of linked list. I have also created a print() method to print all nodes of the singly linked list, separated by space. This method is very useful to demonstrate that our reverse method is actually working or not, as you can print the linked list before and after reversal. If you struggle with implementing essential data structures like linked list, binary tree, the hash table in your own code on any programming language like Java then I suggest you join Algorithms and Data Structures - Part 1 and 2 courses on Pluralsight. They will not only help you to write your data structure but also how to calculate time and space complexity. Here is our sample program to demonstrate how to reverse a linked list in Java. In order to reverse, I have first created a class called SinglyLinkedList, which represents a linked list data structure. I have further implemented add() and print() method to add elements to the linked list and print them in forwarding order. The logic of reversing the linked list is encapsulated inside the reverse() method. It traverses through the linked list from head to tail and reverses the link in each step like each node instead of pointing to next element started pointing to the previous node, this way the whole linked list is reversed when you reach the last element, which then becomes the new head of a linked list. You can see that links are reverse in each steps using the pointers previous and next. This is also known as the iterative algorithm to reverse the linked list in Java. For the recursive algorithm, you can also see Introduction to Algorithms book by Thomas H. Cormen. * Java Program to reverse a singly list without using recursion. You can see that linked list has reversed, earlier 1 was the first element now it is last and 3 is the first element of linked list or head. That's all about how to reverse a singly linked list in Java without using recursion. Yes, we have not used recursion in this solution, instead, we have used iteration. You can see the while loop inside the reverse() method. Btw, if you get this question asked on the real interview, you would be most likely asked to reverse the linked list using recursion now. So, wait for my another article to see that solution or check out the Cracking the Coding Interview book, which contains a solution of this problem along with several others. P. S. - If you are looking for some Free Algorithms courses to improve your understanding of Data Structure and Algorithms, then you should also check the Easy to Advanced Data Structures course on Udemy.